This was a video posted with false caption by News 18 Telegu and is getting circulated on social media. Please find more details at the verification section of this article. Finally Indians Began To Strike..Petrol Price Hike In Orissa Rs 100 Per Litre. Verification: The Petrol Pump In Puri Was Attacked Because They Were Cheating Their Customers. 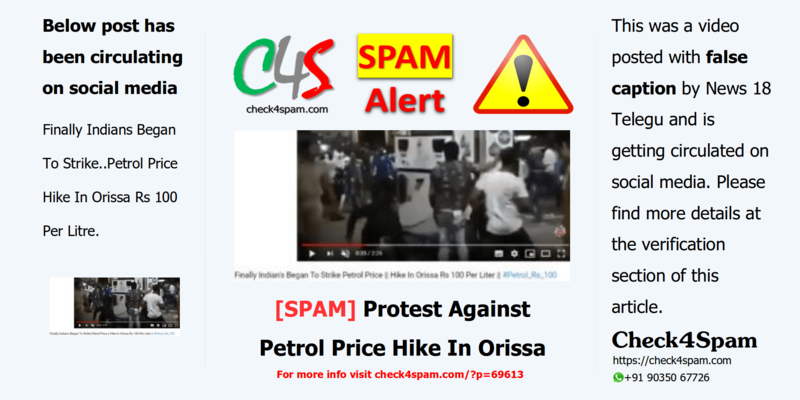 In Puri, the incident was not due to the hike in petrol prices but due to petrol pilferage. The incident took place on September 28, 2018 when petrol prices in Puri were hovering slight above Rs. 82 per litre. This incident took place at the Khuntia Petrol Pump, near Hospital Square in Puri. Local people told that the petrol pump was cheating them by filling less fuel to their vehicles than what they paid for. That was the reason behind the incidence. The video then started circulating with misleading captions. News 18 Telugu posted this video with false caption. If we are little cautious about the news or message we get from uncertified sources, we should not believe it immediately. Check the same in other sites, channels, read the posts and comments. Below is the screenshot from the video and the link to video with actual news. Read more.